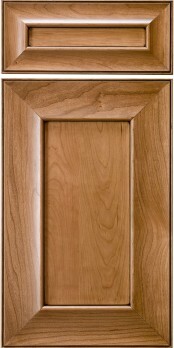 Woodridge (miter) is one of Conestoga’s newest, and most distinctive, designs. The frame is a reverse pillow miter, meaning the framing is actually concave. This effect, combined with the beaded outside edge, gives a really contemporary flair to the door and takes on the look of a beautifully crafted picture frame. Cross section below is an example only. Profiles you may choose will affect final look.